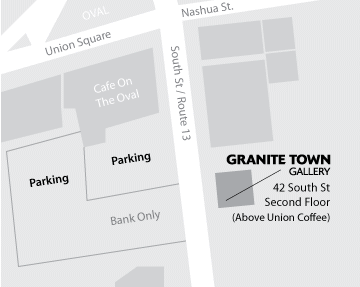 Contact Granite Town Gallery, Fine Contemporary Art Gallery located in Milford, NH. We are located mere steps south of the Milford Oval, above the popular Union Coffee restaurant in southern New Hampshire, in the town of Milford. South Street is also known as "Route 13". Parking is available in the small lot across the street adjacent to the Cafe on the Oval restaurant, and also at the far end of the TD Bank lot, and there is ample on-street parking on South Street, or around the oval. Do not park in the TD Bank parking lot, unless it is after business hours. We welcome all interest in our artists and their artwork and invite you to contact us about special off-hours viewings by appointment, or other special requests. We are a new gallery and as such, are building our stable of quality artists. If you know of artists who are looking for representation, please send us their contact information. If you are a working artist and are looking to exhibit your work, please contact us using the form below to schedule an interview. We are developing a method to allow artists who are registered with our site to upload low resolution JPG images as samples of their work. While we pull that functionality together, please include links to sites at which your work samples may be viewed. Thanks for your interest in Granite Town Gallery!